For over a decade, ZENMED® has been at the forefront of developing Doctor-formulated skincare targeted towards persistently troubled skin. Their formulas yield fast, effective results based on the fact that their naturally-based botanical emulsions are Dr-formulated for troubled skin using esthetician-grade, medicinal actives. Their skincare products are Vegan, made 100% recyclable packaging, and their free of animal testing, dyes, fragrances, petrochemicals, sodium lauryl and sulfates. They offer skincare products for all skin types as well as every skin concern, including Acne, Rosacea, Hypersensitivity and Eczema. They sent me their Complete Acne Kit for review. ZENMED’s Derma Cleanse formulations are created for long-term clear skin. All their formulations on the exfoliating qualities of alpha and beta hydroxy acids that will prevent dead skin build-up from happening in the first place, hence preventing pimple formation. 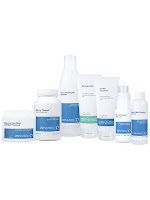 This acne kit is so gentle it will work amazingly well for anyone with acne mild to severe. Although I don't have severe acne, I occasionally break out around my menstrual cycle and this kit really helped clear up my skin! Unlike most acne treatments, it never left my skin dry, peeling or irritated. Botanical ingredients have a similar makeup to that of what we have in our cells. When you get rid of the toxic ingredients and replace with the high quality, naturally sourced ingredients, your skin will magically transform. My favorite products from the line are the Acne Gel Cleanser, Botanical Acne Mask and the AHA/BHA Complex toner. The cleansing gel effectively cleaned my skin and left it feeling fresh and clean with no dryness or irritation. The AHA/BHA Complex toner is wonderful. It took off all dirt and make-up and helped clear my skin of dirt and bacteria. This is the only toner I've tried that didn't dry my skin out and left it feeling refreshed. The botanical mask is nothing short of amazing! It firmed and toned my skin, helped clear up my breakouts and even helped fade some of old scars with just a few uses. I highly recommend you try the entire kit because when the products are used in combination with the pills, refining scrub, derma gel, and oil-free moistruizer, you'll acheive the best results! ZENMED's gaurantee: See results within 24 hours of use. Their so confident you'll love the products, they offer a 60 day money-back guarantee and free shipping on their acne kits. To learn more or get yours, please visit: ca.zenmed.com.